We caught the train from Malvern Station, which would take us to Colwall, a minute or so before 10 a.m. We should have caught it at 9.48 a.m. but it was running 8 minutes late, so the extra minutes gave us time to consider what we were letting ourselves in for. 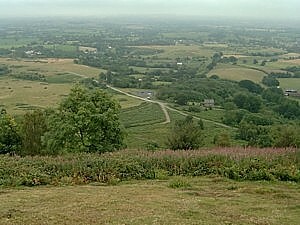 Larry, Mick, Peter and I had left Warwick shortly after 8 o’clock for our latest adventure, a walk along the Malvern ridge. We were really looking forward to it. The weather forecast earlier in the week had promised a very good day, but as we got nearer to the walk date it looked increasingly that we would have some rain, and we did. Within 10 minutes of leaving Warwick the heavens opened and rain accompanied us all the way to Malvern Station. On nearing Malvern it was so bad we were even considering staying in the car until the weather improved. But on arrival at the station the rain did became less so we got our boots on, got tickets and waited for the 9.48, and a few minutes later, from the shelter of the platform we watched the rain start to get worse. The train journey took 8 minutes. As we approached the tunnel, that would take the train from the east side of the hill to the west, one of the “boys” remarked that it might be dry on the other side of the hill. I remember replying that “pigs might fly”. Well we didn’t see any pigs but as the train pulled in to Colwall the rain started to ease and the sun started to glimmer through the clouds. Maybe the day would not be as bad as it promised to be less than an hour ago. 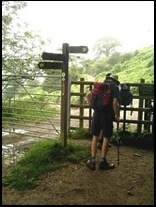 We crossed the railway line and soon were following field tracks towards the Herefordshire Beacon, or at least towards where we expected it to be under the mist. I had expected this part of the walk to be bad and I was not disappointed. The ground was wet and muddy. Mick, Larry and I were all in shorts and so our bare legs were slashed by the damp grasses etc. Peter had decided on long trousers which, although giving protection, were soon muddy and wet. 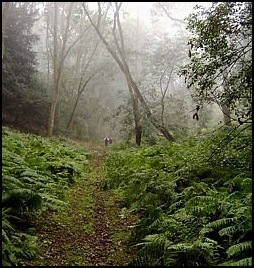 In addition, our walking boots were soon very wet, but once on proper paths we expected them to dry out, which they did. 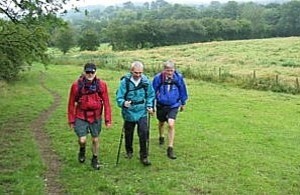 On the left - Mick, Peter and Barry walking from Colwall Station towards the "Hills". 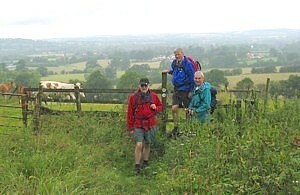 On the right - Larry made sure he was first over the stile and away from the bullocks on the pretext of taking this photo. 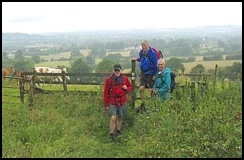 So across the fields we went, stopping at one point to put on rain wear – it had started to rain again - gradually ascending, and passing some inquisitive looking bullocks, which were given a wide berth (especially by Larry), until we reached and crossed the A4014. The path the other side of the road indicated the route for the “Worcestershire Way South”, which we followed. 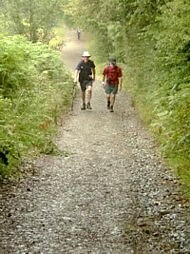 At some point along this track we could have gone east/north to get onto the Herefordshire Beacon but Peter and Larry had different ideas. They’d got the map and lead Mick and me the mile or two to the west side of The Gullet near one of the entrances to Eastnor Park. 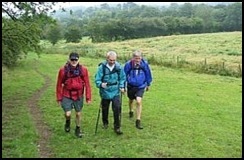 Left to right, Larry at one of the entrances to Eastnor Park admiring his feet!, Larry and Mick with Peter in the distance trying to catch me up on the track to Hollybush, and Peter with his walking poles at the ready to assist with the ascent of Midsummer Hill. By now it was getting close to noon so we stopped here for food and drink, before continuing southwards. Peter and Larry seemed to know where they were taking us and soon after we arrived at the small community of Hollybush. But when were we going to start getting on these hills? 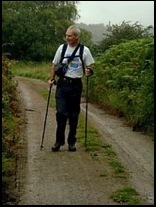 “Soon”, Peter assured us, as we walked east through Hollybush before taking a minor road left (north) and soon after a damp and very steep track west. Now this is what I called an ascent. There was a less steep route, but I think we all would rather have short sharp shocks than longer gradual climbs, and this was certainly a short sharp shock. Needless to say I was the fourth to reach the top of the hill, but I did stop half way to remove my waterproof - the others, being more optimistic about the weather, had removed theirs earlier. lightened the photograph you can see it was a very "grey day". 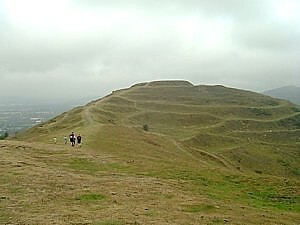 It had taken about 20 minutes to climb this ascent - Midsummer Hill (286 metres) - and then about half that amount of time to take a track from the top, going north west, which brought us to the west end of The Gullet, where we had enjoyed lunch about an hour and a half earlier. 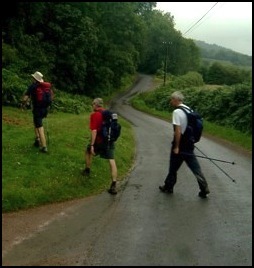 If we do this walk again Peter, Mick and I know a short cut! Peter and Larry had not hung around to “enjoy” Mick’s and my comments about the route as they were in front descending east down The Gullet for the start of the next ascent. 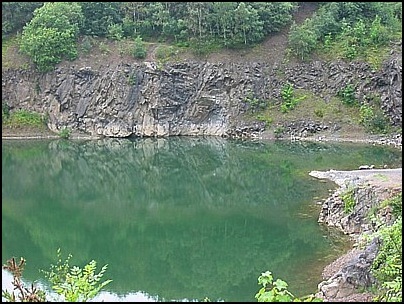 Towards the bottom of The Gullet, on its north side, is a quarry face with a lake below. We went anti clockwise around part of the water and then followed Peter up a path to the start of our next ascent. The lake near the bottom - eastern end - of the Gullet. Another Larry picture. During the morning Peter had taken a “lot of stick” about not having shorts on. Now it was his turn to have a laugh at our expense. The route was horrendous. The path was narrow. The vegetation was high and damp and consisted of nettles, brambles and bracken and us ”short” boys were really glad to reach the top of this ascent, which is called Swinyard Hill, having had our legs stung, scratched and whipped as we plodded upwards. 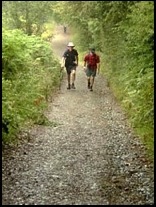 on the ascent of Swinyard Hill. Yet another picture by Larry. Views on Swinyard Hill. On the left looking north towards the "Boys" who were just a little way ahead, and on the right the view downhill to the east. 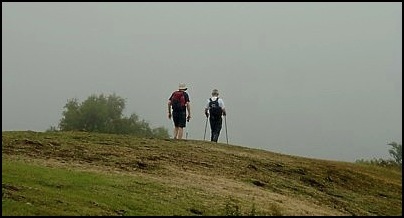 By this time, the mist had cleared considerably and the views were better, particularly towards the east. 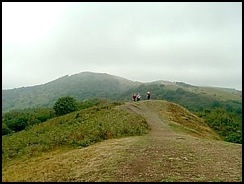 So a few photos were taken before we continued northwards, passing Hangman’s Hill, Clutter’s Cave and Broad Down, before we reached the path to the top of Herefordshire Beacon. I must admit after the previous two ascents I was feeling a bit weary, but, as so often happens, Mick gave me a verbal kick up the back side and soon after the top of the hill was reached. As the path to the top was very good it wasn’t as difficult (tiring) as I had expected. 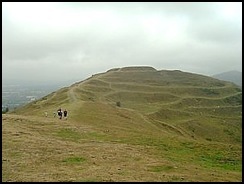 From here it was a short descent and ascent before the top of the British Camp Hill Fort was reached. Then it was downhill again to reach the A4014, where we enjoyed a cup of tea from the small café/shop located on the roadside. Views of the British Camp and parts of the surrounding area. Tea finished and refreshed it was back on to the hillside, always taking the highest path to get the best views, as we headed north to Upper Colwall, where the Malvern Hills are dissected by the B4218. This was probably the most enjoyable part of the walk. Although, like most of the route, it was a bit of a switchback, it was a comparatively easy switchback. It didn’t seem as steep as other parts we had walked and the views were good. 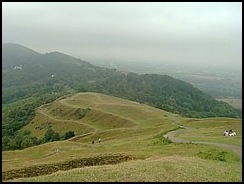 We had a bird’s eye view of Malvern Wells, although the lack of sun and the haze were not conducive to getting good photographs. However, there was a downside to this part of the walk. 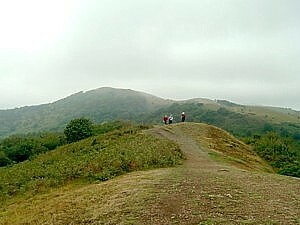 In the distance was Worcestershire Beacon, which at 425 metres is the highest point in Worcestershire, and had to be “conquered” before the end of the walk. 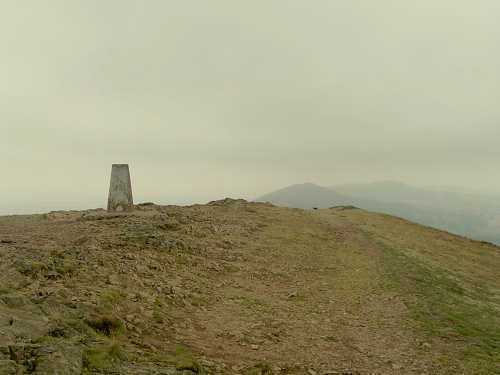 We had considered not going up the Worcestershire Beacon, which would give us time to get to a local hostelry, but we decided not to forgo this final ascent, which was much easier than expected. We crossed the B4218, and followed Beacon Road uphill towards this last “peak” and, even when the access to vehicles ceased, the route still remained good. The gradient was not excessive and the surface was tarmac - very easy walking. And although the last couple of 100 yards was a bit of a pull it was, as stated earlier, much easier than I had expected. 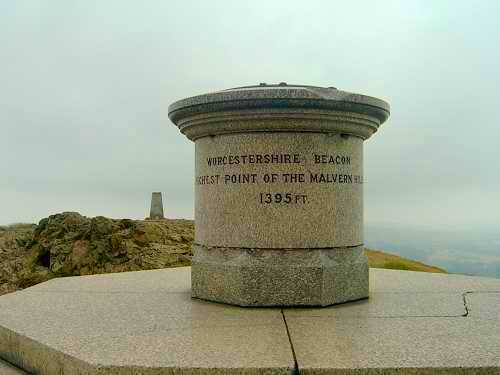 Photographs taken at the top of the Worcestershire Beacon. A few photos were taken and then it was downhill. This was probably the most dangerous part of the day. 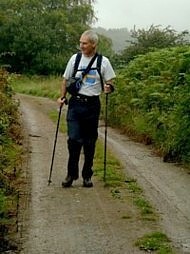 The route was steep, and the grass was damp, which are excellent conditions for slipping. Fortunately I had my walking poles and, although I was slow, I got to the bottom of the slopes without mishap – although I did go a longer way at one point to reach St Ann’s Well. However, I must congratulate Mick on his wonderful posterior grass surfing technique when he lost his footing and enjoyed a very fast few yards of descent. The sad thing was I wasn’t able to capture the moment on film. However, we all reached the bottom of the hill safely and then it was a walk through the town back to the Malvern Station, where we enjoyed its café facilities before returning to Warwick. It had been a memorable day. 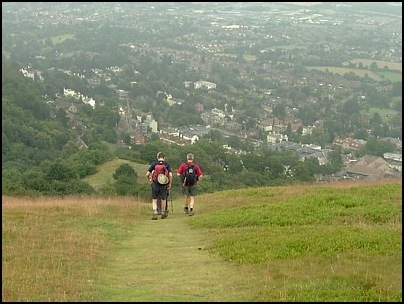 Walking downhill towards Malvern, prior to Mick's "surfing"
Navigation? 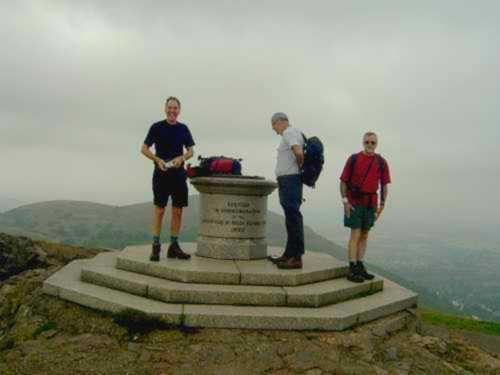 Larry and Peter had the Ordnance Survey Explorer Map No. 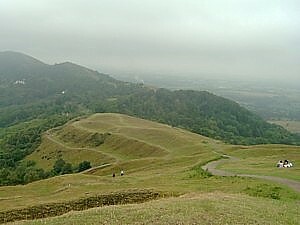 190, which covers the Malvern Hills and Bredon Hill but it wasn’t used much, particularly around Midsummer Hill. And the distance? I suppose it was a good 12 miles.